You can smell the sweat as you approach. It's not sweat from exercise or from fear – it's because we haven't showered for a week. Our clothes don't just smell bed; they are filthy. And yes, that purple stain on the front of my shirt is bird crap. As are the purple stains on my hands and under my finger nails. It's that time of year: the berries are ripe, birds eat as much as they can in order to build up fat reserves for their long journey south, and field ornithologists finally have work. Which doesn't mean that we have paid jobs, per se, but at least we get board and lodging working here, we get to do what we love, and we get to live like Neanderthals for a few glorious weeks. Maybe I'm something of an exception, but the fact that for a few weeks it's okay to smell awful, dress in dirty, torn clothes, and not comb your hair is all part of the fun for me. It also breaks it down to what really matters in life: birds! We get up at 4 am in general, which is actually relatively humane, seeing as this is shortly before it gets light. This means it is not actually the middle of the night, but rather the “real” morning. We walk up and down the lanes of nets we’ve set up, extracting the birds that have been caught in the past hour and taking them to the station to process. At the station each bird receives a ring with a unique number on its leg, is measured, identified, weighed, and released, to continue its frantic feeding and its monstrous journey on to Africa, or wherever it will winter. Of course, as field biologists, the one thing we can plan with certainty in our work is the fact that we cannot plan anything with certainty. We never know in the morning what the day will bring. We never know when exactly we will leave the station to go to the net lanes to extract birds; we don't know how many birds we will find, nor what species they will be. A typical day is busiest from 4 to 10 am; then gradually the number of birds begins to slow, approaching zero, and we check the (almost) empty nets just every hour until 10 pm. Of course there is no such thing as a “typical” day, but the fact remains that most of our time is spent doing other things than just cuddling birds. In fact, we spend far more time talking about our work than actually working. For example, we take bets each hour on how many birds we'll get. We take bets each day on what will be the “best” bird of the day. We are extreme favoritists when it comes to birds: wherever we work, the species that we catch the most are considered “boring”, while the rarer, bigger, and more colourful a bird is, the “better” it is. We are always pretty delighted to catch these ones, though one might argue that the bird would prefer not to be so special – it gets held by everybody, is double-checked from the literature, and its picture is taken, before these guys are allowed to continue on their migration route. Food is one of the most important topics in our daily lives as birders. Of course, we look for the fat stores in every bird that tell us whether or not the bird is ready to start the next step on its migratory route. But the humans studying them also seem to eat more during the birds' migratory period than during other times of the year. I know I tend to eat more to make up for lost sleep. When we cook, we generally cook for eight, even if there are just four of us. If there are left-overs, they'll be finished by dinner time. And what we cook is highly limited as well – by time, by infrastructure (there's only one small stove), by the fact that there is almost always at least one vegetarian, and by the fact that we have no freezer and only a small, solar-powered fridge that might not work all the time. So our recipes are often limited to pasta with tomato sauce, pasta with cheese sauce, and rice with vegetables – if we get to cook at all, that is. Sometimes the birds (or the weather) don't behave like they're supposed to. Maybe you plan to cook at 11 in order to eat at noon, a time when there are usually very few birds — and then suddenly a flock of sparrows enters the nets. The stove is turned off at once; all hands are needed at the nets to extract the birds. Sparrows (old world sparrows, that is) have a habit of getting caught in big flocks, or not at all. So lunch is postponed indefinitely, and now perhaps it becomes clear why we always have such large supplies of chocolate and cookies stashed in the station. Remember, we had breakfast at 5 am; we are relying on chocolate to get us through till lunch. In the afternoon when things finally quiet down, and you really cannot eat a single bite more, then we find other ways to pass the time. Sleeping is a popular one. We are well-practiced in sleeping whenever there is time, no matter time of day. Then, of course, there are games. There are the traditional card games, but there are also the games that would only make sense to an ornithologist: like the Svensson game (Svensson is the European version of the Sibley bird guide). One person reads out the description of a bird and the others have to guess which species it is. The same can be done with bird songs or calls, if any of you are technically equipped enough. Or we play “who am I?” using not-so-famous birds in place of famous people. But honestly, our favorite way to pass the time is telling stories of the time you saw that one really exciting bird, or about the birds you saw on your last trip to that far-away place, of what other people did when you went bird-watching with them, of how you once had to extract that raptor from the net and it almost sliced open your hand. And of course, all these tales are constantly interrupted by “look, there's something flying” and everybody jumping up, trying to be the first to identify the dark spot in the blue sky, and arguing over what they think it is. If you love birds, you definitely have to get used to the often somewhat peculiar habits of birders; and if you love nature you definitely need to get used to being dirty and smelly and enjoying it. After all, that means you're doing what you love. Martina's love of birds is almost as old as she is (33). 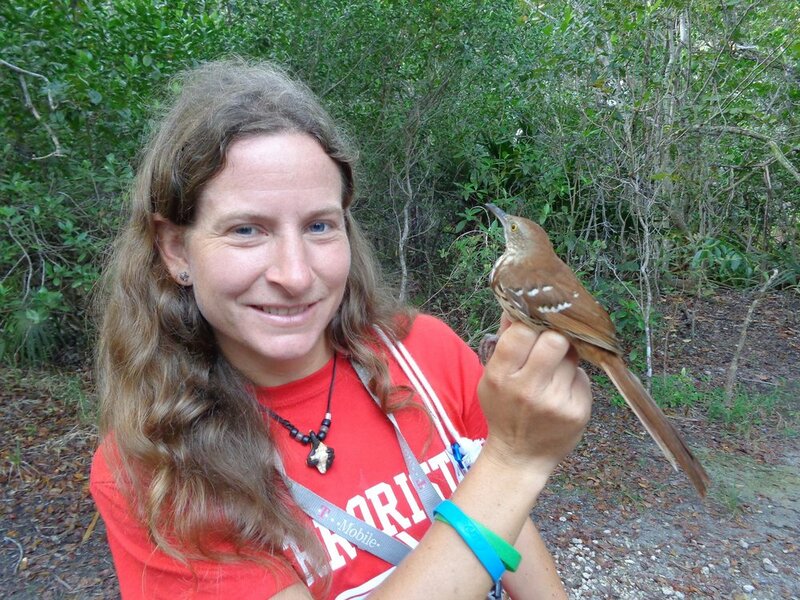 Her first summer job was at a bird ringing station, where she was immediately hooked. Fascination with bird migration determines much of her life, from study and scientific work to private life: she has decided to live a nomadic life just as her feathered friends do. So far she is doing quite well at it, having visited most countries in Europe and several parts of North America, aiming to migrate further south in the near future.